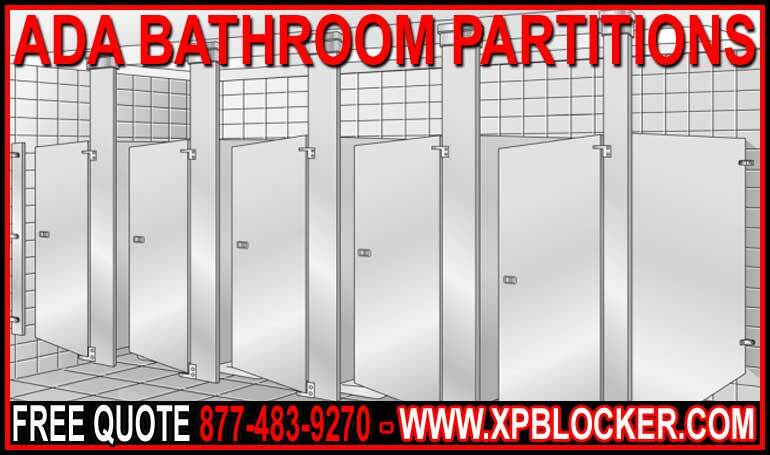 XPB Locker carries ADA bathroom partitions manufactured from many varied materials. Our most durable material build is solid plastic, which offers a longevity and durability unrivaled in restroom partition engineering. Other materials include stainless steel, phenolic, antimicrobial, and baked enamel. Choosing the right material is key to keeping your project within budget tolerance, because height, movement, and positioning of ADA approved bathroom partitions are strictly regulated by federal, state, and local regulations. These regulations must be observed with top priority in order to keep new constructions and remodeling projects in compliance with governing standards. ADA bathroom partitions must provide sufficient floor space clearance for users in wheelchairs. Regulations stipulate a minimum space requirement of 30 inches by 48 inches. Designers have the option of providing additional room so that users can move freely within the toilet stall without colliding with grab bars, toilet paper dispensers, and toilet seat covers. Making sure that the user has sufficient knee and toe clearance is critical, not only for regulatory compliance, but also for general, overall user comfort. Turning space within the stall is the most crucial factor to consider when mounting ADA bathroom partitions. The recommended minimum distance is a 60” X 60” space within the stall so the user can enter, turn his or her wheelchair, and then exit the stall without colliding with partitions, fixtures, or the stall door. Regulations also mandate that entry doors measure at least 32” wide so that users can easily roll a wheelchair into and out of the stall entrance. ADA bathroom partitions should be positioned to allow for a door of at least this size. The door must swing no more than 4” inches from the corner when opened. Doors must open with no more than 5 pounds of force. We have a variety of door handles, latches and locks that can be easily manipulated without the user having to bend or twist his or her wrist. Grab bars must be mounted to ADA bathroom partitions or to an adjacent wall if the stall is located at the end of the restroom. Regulations dictate that bars measure 1 ¼” to 1 ½” in diameter and that they be mounted 33” to 36” from the centerline of the bar to the floor. Grab bars must be strong enough to hold more than 250 pounds of force per foot. At least one grab bar 40” long should be mounted to the partition nearest the toilet or to the wall and be no more than 12” from the ack wall. You must also mount a second grab bar along the back wall measuring 36” long, and the bar must be no more than 6” from the side of the partition or the wall. XPB Locker has decades of design and installation experience. If you have any other questions about ADA bathroom partitions, or if you run into any problems during an installation, do not hesitate to call us for assistance. We have been designing and installing ADA compliant bathroom stalls for well over a decade and are happy to help you with your project.